Aside from the rigors of life on the road, artists often have to put up with promoters who don't pay them, pay only part of what's owed, or try to press them to do more than what their contract specifies. Jim was no exception. 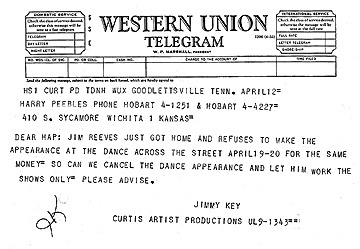 In the telegram above to Midwest promoter Hal Peebles, Jimmy Key (Jim's booker) makes it clear that Jim will not go along with the proposed idea that he also perform at a second venue without being paid extra for it. (Can you imagine the audacity?) Some would call this "ungracious" of Jim, of course. Just like they criticize his insistence that a piano be furnished and in tune. Or that his Blue Boys band not be expected to back any other artists. Yet all of those matters were written in his contracts in advance. So if a promoter violated the contract, it was not Jim's fault. ©All contents copyright 1998 by Julie Campbell. All worldwide rights reserved. Photos and text may be downloaded from this site for personal use ONLY. All photographs used with exclusive permission of their owners, with signed affadavits on file (at the law offices of Wallentine, O'Toole in Omaha, Nebraska) attesting to this fact. Any re-use of photos/text is strictly prohibited and will constitute violation of copyright, with violators prosecuted to the fullest extent of the law.